A recent poll conducted by Insightrix Research in collaboration with CJOB News/Global News shows that support for Stephen Harper and the federal Conservative Party is high in Manitoba. 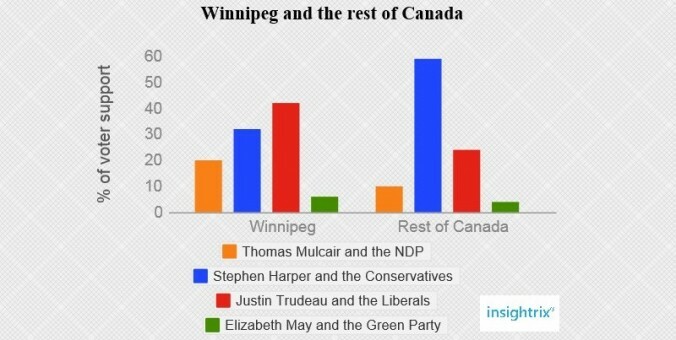 However, Justin Trudeau and the Liberals are gaining ground, particularly in Winnipeg. The poll found that 44% of Manitobans support the Conservatives, while support for the Liberals sits at 34%, the NDP at 16%, and the Green Party at 5%. While the Conservatives lead support in the province, Trudeau and the Liberals have the most support in Winnipeg with 42% of voters saying they would vote for the Liberal Party. The Conservatives stand at 32% in the city, and the NDP have 20% of voters’ support.